Library Displays — The Bartram Garden Club, Inc.
Click on any picture to get a larger image. This design was created by Beverly Williams during advanced floral design unit 8. Students were asked to interpret the title “Fire.” Dried Palmettos and Cyperus were painted to depict the various colors of fire. The wooden sculpture was made by Marc Williams. Click here to see a list of materials. Pattie Pitts created a traditional design using Ivy, Podocarpus, Boxwood, and Palmetto Palm evergreens with contrasting textures and shapes. The Alstroemeria blooms brighten the design, as well as the chartreuse container. The placement of woven rope helps link the round forms of the Hydrangeas, and lead the eye through the vertical components of the design. By Sue Lord. 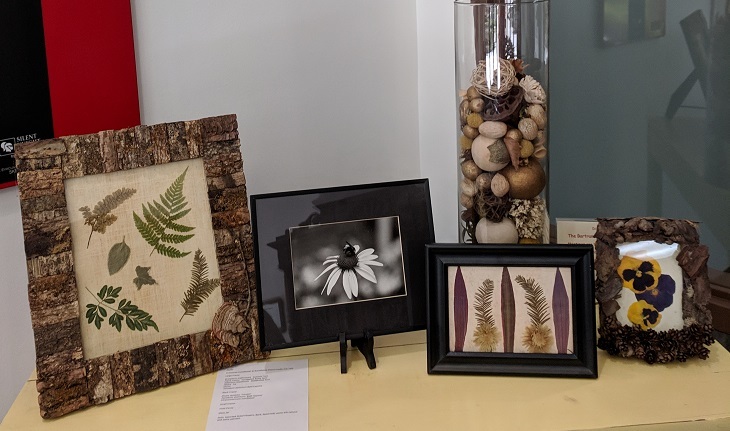 This design, composed of dried Agapanthus seed heads, a manipulated Aspidistra leaf, and Solidago (Goldenrod) was artfully exhibited by Marianne Salas. This sunny line design by Kathleen Lunman takes the chill off of a January day! Plant materials are Palm spathes, Helianthus, Tillandsia usneoides (Spanish Moss), Cladonia rangiferina (Reindeer Moss), Magnolia grandiflora, and Salix matsudana (curly Willow). Thanks, Kathleen, for spreading a little sunshine! Thanks to Frances Tidd for offering this vibrant design which encourages us to “dance like nobody’s watching “ throughout the new year! Yaupon Holly, Chrysanthemum and Longleaf Pine are organized in this Ikebana design by Sue Lord. The choice of plant material certainly evokes the spirit of the Holiday Season. The outline of this “snowman” created by Beverly Williams was formed by stacking three decorative wall shelves. Dried Palmettos fill the body and head spaces. The eyes, buttons and nose are pinecone rosettes. Dried Papyrus forms the arms and hands, while a pinecone completes the top hat. A fantasy flower made of dried fishtail palm leaves adds depth to the body. 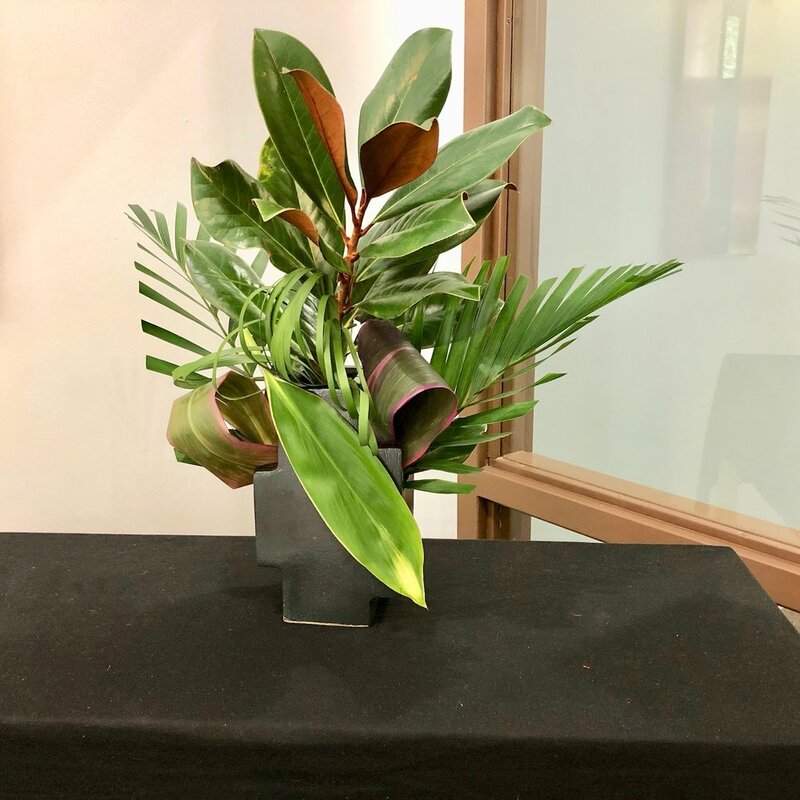 Thanks to Frances Ambrose for contributing an arrangement of contrasting foliage comprised of Magnolia grandiflora, palm, ginger, and manipulated Aspidistra and Cordyline fruiticosa. Driftwood, a hammered copper plate, moss and birch bark are the composition materials in this fall design by Frances Tidd. Fun for all ages! Frances Tidd crafted this whimsical Halloween exhibit using components found at Dollar Tree. The painted Palmetto fronds unify the jack-o-lanterns and add an extra “scare” factor. Sure to bring out the child in everyone. Components of this creative vignette by Peg Lehosit cleverly express a literary theme appropriate in a library setting. Faux leaves of printed material attached to a Prunus caroliniana (Cherry Laurel) tree branch and dispersed on the underlay evoke the spirit of Fall, when students return to school. One can almost feel a cool, seasonal breeze blowing through the trees by the angular placement of the branch. The birds on this beautiful copper basket look happy perched on a bed of dried Celosia, Hydrangeas, Lotus pods, and Magnolia Pods artistically arranged by Frances Tidd. Autumn is in the air. Two coordinating containers provide the base for this green and yellow stretch design by Beverly Williams. Plant material is Sansevieria and the seed heads of the Agapanthus plant, seeds removed. Cut stems of both plants are long lasting and do not require a water source. This design by Carolyn Stevens is an excellent example of a “Featured Plant Material” design, a design type new to NGC floral designers. The 2017 NGC Handbook for Flower Shows defines this as a design with an emphasis on one plant species, and any part of the plant may be used. Carolyn’s design features the Strelitzia reginae plant, commonly known as Bird of Paradise. Balanced inside two coordinating frames, she has combined individual plant parts (stem, leaf, flower, and flower with stem) into a singular, cohesive work of art! Great job, Carolyn!!! Many thanks to Marianne Salas for contributing both a creative mass-line design and a traditional mass design in August! The contrast of textures, color, and forms adds interest in the mass design, while the unique choice of components in the mass-line is very imaginative and creatively executed. This beachy design by Frances Ambrose features a beautiful piece of weathered driftwood punctuated with greenery and chrysanthemums. Another burst of colorful fresh plant material from Kathleen Lunman! The base is an abstracted book created by the designer. Inspired by the Victorian homes of Amelia Island, this grapevine wreath was covered with dried Statice, Celosia plumosa, Celosia cristata, and Zingiberaceae (Ginger). To complete the Victorian ensemble, designer Frances Tidd added decorative fiber balls and 5 demitasse cups and saucers, a lucky thrift store discovery. The lacey doily enhances the theme. Thanks, Frances! A boat of fresh Carnations, Mums and Statice in shades of pink invite Library patrons to ,”Sail into summer with a good book.” Manipulated stems of Cyperus plant mimic sails. Design was created by Kathleen Lunman. Beverly Williams contributed this line design using manipulated Aspidistra, Sansevieria, dried grass and Flapjack succulents. No water source required. Glue Dots is a designer’s best friend! This pristine green and white design titled “Stairway to Heaven” was created by Nancy Ellison. The container is cleverly supported by glass bookends purchased at a local thrift store. Katie Aquino chose flowers which repeat the colors in this whimsical clown container. This design certainly evokes the spirit of Spring in anticipation of fun times ahead! “Just Hatched” pave Easter chick design by Fran Kienle incorporates fresh mums and palmettos. The beak is cleverly represented by a pine cone. Fun for all ages! This pot et fleur design was created by Anne Henson using three potted plants. The grape vine line was strengthened by the placement of red carnations which balance the red bloom of the Bromeliad. Blades of green grass complete the line and enhance rhythm and balance. Pattie Pitts created a design featuring primarily Florida native evergreens. The Spanish moss provides interest and contrast in texture and color. Palmettos define the line in this mass arrangement. Titled “The Color Purple” this group mass design was exhibited by new club member, Debby Arnold, and harkens the spirit of approaching Spring. The creative staging of purple books enhances rhythm and adds height to the overall design. This mass line design was created by new club member Sandy Taylor. Sandy took our Basic Design Study classes last summer, and her desire to learn and create is a boon to our garden club! The Palmetto red “heart” in this design is a creative expression of Valentine’s Day. The cake stand adds height to the overall arrangement. Four types of greenery enhances texture, and establishes a main line which is supported by red and white carnations. Good job, Sandy!!! Pulling from Winter’s bounty, this mass line design using all dried plant material was created by Beverly Williams. Dried components are Dock, Ting Ting, Iris seed pods and pine cones. The large fantasy flower was formed by glueing dried fern leaves to a pine cone. Stacked pine cones in the bottom of the container adds stability and rhythm to the overall design. The club's first library display was designed and placed by Frances Tidd in October 2016. 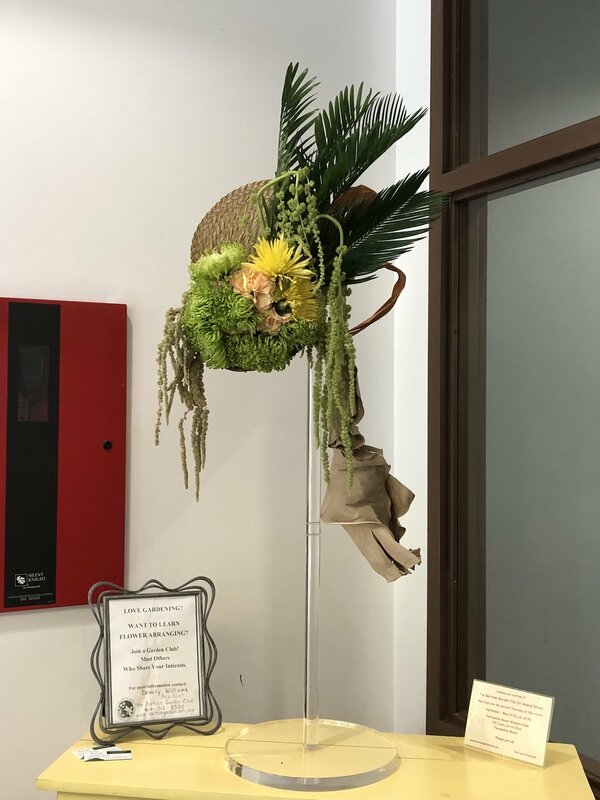 The arrangement features various epiphyte specimens along with a small plaque giving information about the Bartram Garden Club meetings at the library. The November library exhibit was designed and placed by Kathleen Lunman, evoking the colors and spirit of Fall. The library display for December is a festive creative design by Frances Ambrose. It is a custom crafted sculpture, simply stated with painted dried leaves and fresh carnations. The January 2017 library exhibit was created by member Beverly Williams. The dried Agapanthus seed heads were painted to depict New Year's fireworks. Additional line is created with metallic wire which reflects light. February's library exhibit was created by member Kathleen Lunman and is a floral interpretation of the Mardi Gras season. Kathleen added a new design to the library in February to acknowledge the coming of spring flowers and fresh leaves on the trees. Click on any image to see the full content. The March 2017 library design was created by member Peg Lehosit in recognition of the vast resources available at libraries. Visit the Fernandina Branch of the Nassau County library network sometime soon. The newly renovated facility has a lot to offer to our community. A second display for March was placed by Mariette Wooden with a design interpreting St. Patrick's Day. For the April library display, this Easter vignette was created by Claudia Burningham and Elizabeth Rawson. The early May exhibit was placed in the library by Frances Tidd as an encouragement to be good stewards of our beaches. The exhibit features a number of common items that beachgoers take with them on their outings and is a reminder that "If you pack it in, then pack it out." Later in May, Frances Tidd placed this design in the library to commemorate Memorial Day and to honor all those who served our great nation. In early June, Frances Tidd placed this design in the library to celebrate the fun of summer. Later in June, this design was placed by Frances Tidd. In early July, Frances Tidd placed this design in the library to celebrate our country's Independence Day. 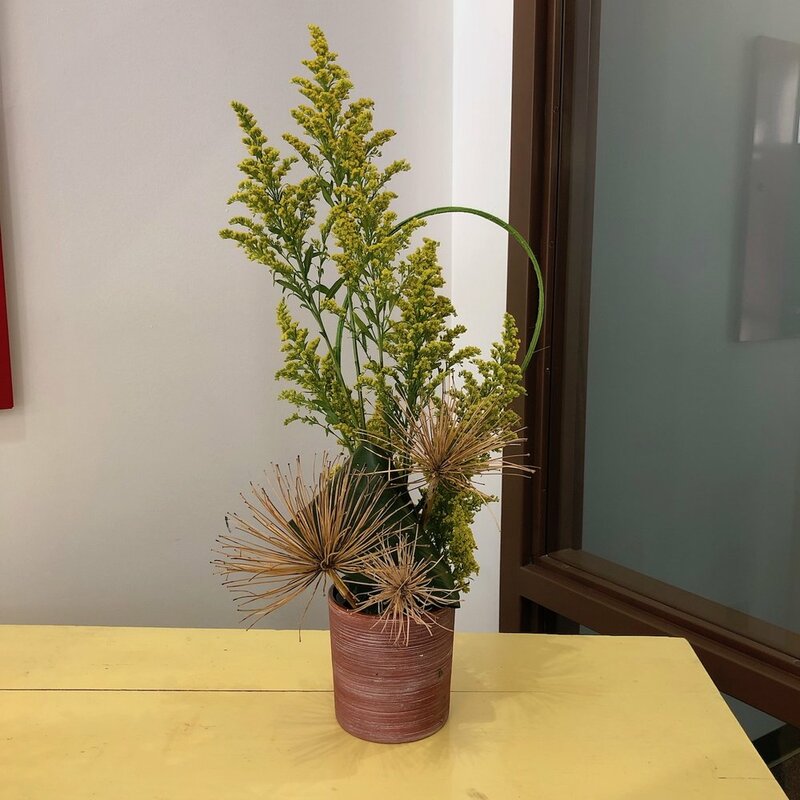 For the mid July exhibit, manipulated Cyperus gives an otherwise traditional design a creative flair. The container is a 4" terra cotta flower pot inverted and topped with a 6" saucer painted to match. A needlepoint cup holder anchors the plant material and provides a water source. Design and container created by Beverly Williams. In early August, 2017 this line design utilizing fresh and dried plant material was placed by Frances Ambrose. 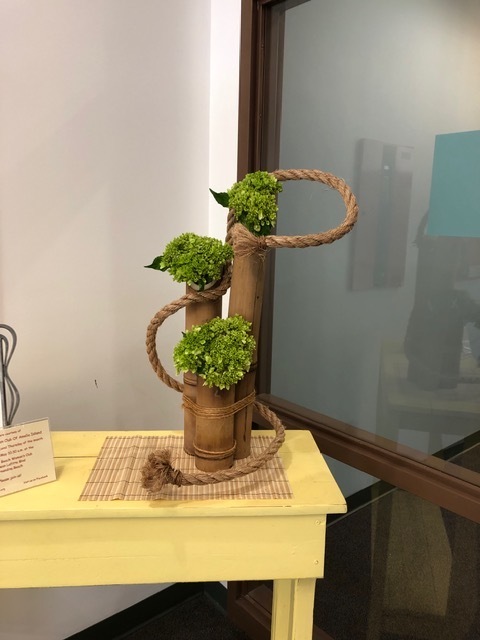 In mid August, 2017 this exhibit was placed by new member Katie Aquino, one of our emerging Floral Design Study students. In early September, 2017 this multi-rhythmic design was created by Beverly Williams, featuring fall mums, manipulated Aspibistra elelatior leaves and metallic spheres. Painted cardboard packing material is woven through the design to enhance rhythm and texture. Placed in mid September, 2017 this creative mass design features dried Magnolia grandiflora, dried Hydrangea macrophylla, Rhus (Sumac) seed pods and palm spathes. The design was originally exhibited as a fresh flower arrangement by Beverly Williams in a 2012 flower show. This display was placed in the library in mid October by Frances Tidd. This vibrant exhibit was placed by Frances Tidd. The dried Cockscomb Celosia forms mimic the pattern of the container, while the thoughtful placement of the base and drape help punctuate the principles of rhythm and balance with the continuation of color throughout the design. By Frances Ambrose, this design is comprised of dried and painted palmetto fronds punctuated with a contrived flower made from fishtail palm evokes the holiday spirit. Beverly Williams placed two designs in the library in mid December. Glass blocks purchased at a big box home improvement store act as “containers” for this parallel design. Dried plant material was flocked with canned snow to interpret “I’m Dreaming of a White Christmas” theme. The “bows” are dried manipulated Cyperus foliage. This hanging Botanical Arts design is staged on foam board insulation. All materials, including the frame were purchased at thrift stores. Fresh juniper hot glued to the frame is the sole plant material.